Our kids have become seriously snow obsessed. Even more so since we had our snow days a few weeks ago. Now it's still January, but you would never know it since that last little speck of snow dried up it's been 70 degrees everyday. The summer lover in me is not complaining one tiny bit, but the kids...they are another story. They want snow! 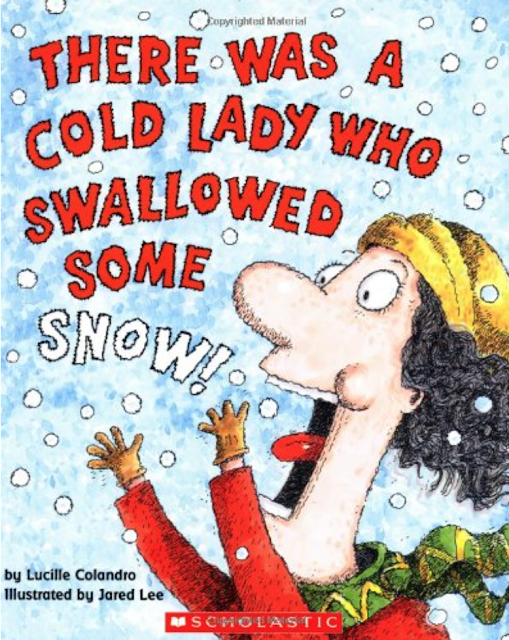 So when we sat down to pick out what books to read to class this month, I was not surprised one little bit that they all had a snow theme to them. The book There Was a Cold Lady Who Swallowed Some Snow was my inspiration for the month's Children's Book Club. 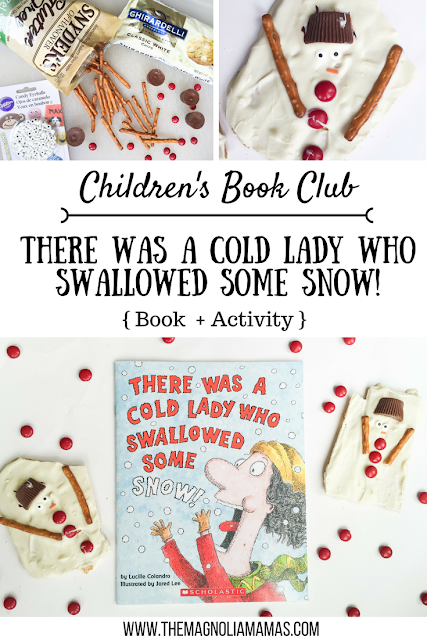 After reading it with The Cute's, I realized I had seen a fun idea for a treat that would pair well with the reading. The "Old Lady" series is always one that gets tons of giggles when we read it, so I knew the combo would be a huge hit! And now for the treat to pair with it. 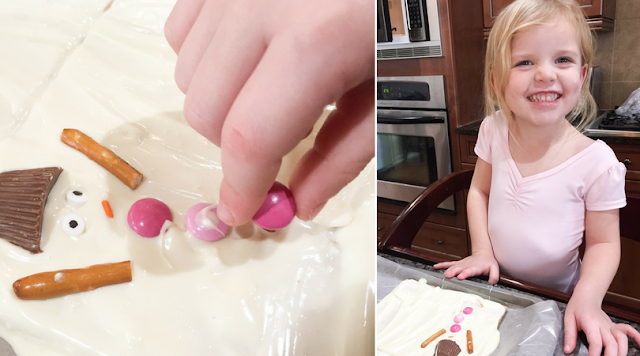 This Melted Snowman Bark is my kind of treat - super easy and no-bake! The kids are also able to help on this one, which is always fun to see. Who knows what their snowman will look like! 1: Line cookie sheet with wax paper. 2: Place graham crackers on top of wax paper. 3: Cut peanut butter cups in half and set aside. 4: Melt chocolate in microwave for 45 seconds. Stir and reheat in 30 second intervals until smooth. 5: Place peanut butter cups, pretzel sticks, eyes, sprinkle nose, and buttons in desired locations. 6: Set aside to cool for 15 minutes. 7: Break or cut gently in between snowman to separate. What is your child's favorite winter story?